This icebox cake is the perfect make-ahead dessert. It stores well, transports nicely, and is the perfect treat to make when you don’t want to turn on the oven! I have a sister that does not like cake, ice cream, or brownies (I know….what?!) – so that means making her birthday desserts can be difficult. Her birthday was last month and her husband texted me asking what he should make for her birthday. Knowing how difficult this can be, I volunteered to come up with something new. She’s obsessed with oreos (oreo truffles are her favorite) and anything with milk chocolate, so I decided to combine the two into an icebox cake. An icebox cake (American) or chocolate ripple cake/log (Australian) is a dessert that doesn’t require any baking. It’s generally made with whipped cream, pudding, and/or chocolate or vanilla wafers, cookies, or graham crackers and layered into a baking dish. Once assembled, the cake is left overnight in the fridge (or “icebox” hence the name). The cookies, wafers, or graham crackers absorb moisture from the whipped cream or pudding and become thin cake layers. Icebox cakes were first introduced to the US during World War I. They gained so much popularity in the US that companies began printing icebox cake recipes on their products. And here we are a century later still making these delicious desserts. Cool right?! While a lot of icebox cake recipes are made with ready-made ingredients (such as pudding and cool whip), we’re taking a few extra steps to make this cake from scratch. See the instructions directly below. Trust me, it is worth it. This is easily the best icebox cake I’ve ever eaten! This cream takes a little bit of effort, but I’ve included step-by-step photos and as much detail as possible to make the process a breeze. 2nd process photo (see above): Add dutch process cocoa powder and HOT water. 4th process photo (see below): this is how the chocolate cream will look once all the whipped cream has been folded into the chocolate mixture. This cream chills for an hour and then it’s time to assemble this icebox cake! Once the chocolate cream is finished, assembling this icebox cake is a breeze! 5th process photo (see above): Dip separated oreos (no need to separate or remove the creme filling) into milk and layer a pan with the oreos. 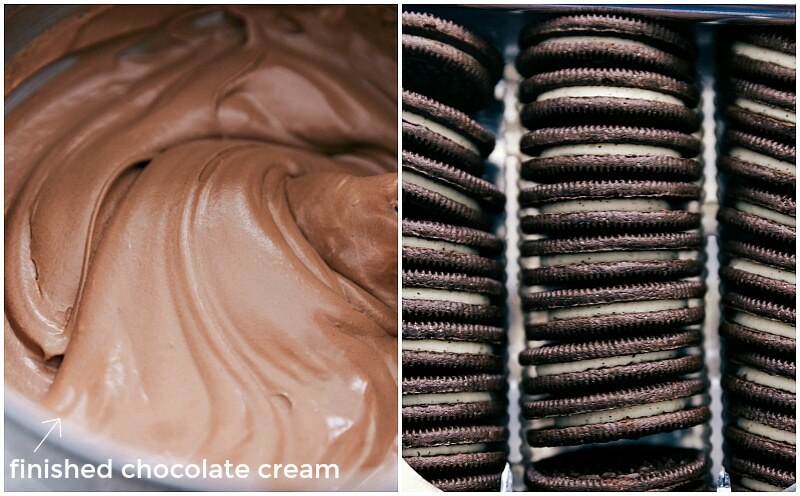 6th process photo (see below): Add a layer of chocolate cream onto the oreos. 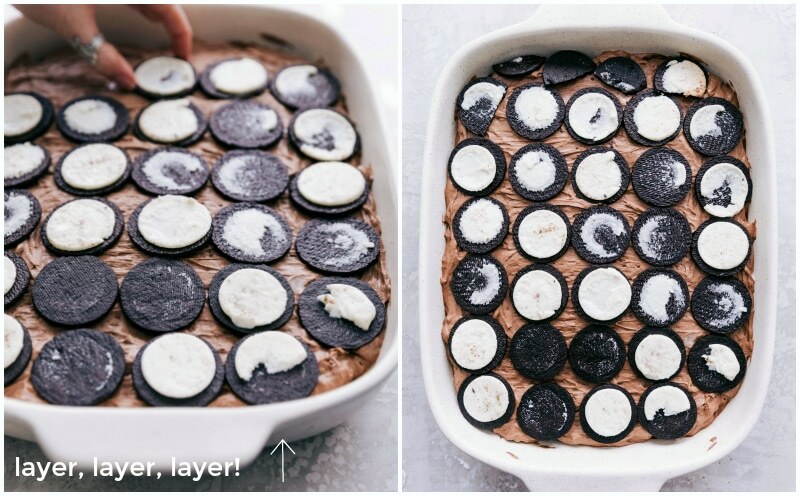 Alternate a layer of oreos with a layer of chocolate cream until at the top of the pan. End with a layer of whipped cream and chill until ready to serve! 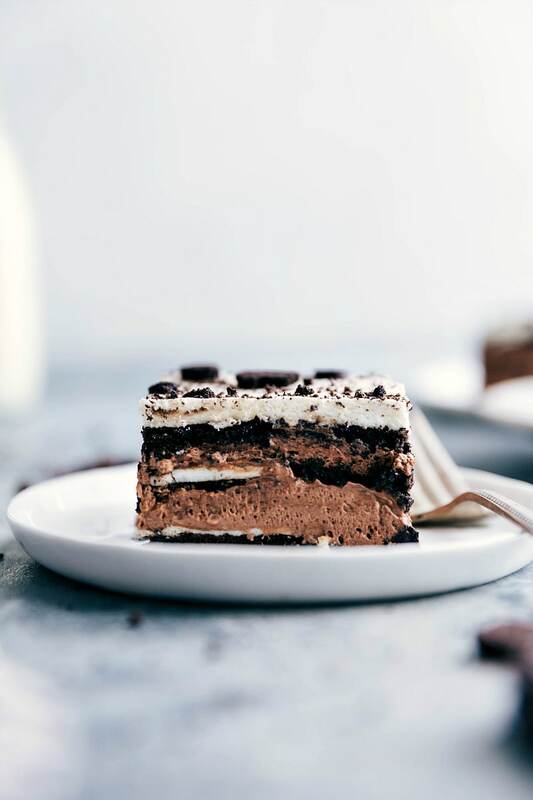 Allow for plenty of chilling time: For best results, the chocolate cream needs an hour to firm up and the entire icebox cake needs a good 8+ hours to chill and solidify (overnight is best). Use good quality ingredients: the better the ingredients you use, the more indulgent and delicious this icebox cake will taste! Use real oreos, pure heavy whipping cream, dutch process cocoa powder, and good chocolate chips. Also, it’s amazing how good this cocoa powder is. I’ll never use anything else from now on! Melt the chocolate slowly: to avoid burning or later seizing your chocolate, make sure to take your time melting the chocolate. Don’t rush this! Melt the chocolate chips in bursts of 15 seconds making sure you stir in-between each burst for 15 seconds. Remember the chocolate is still melting even outside of the microwave. 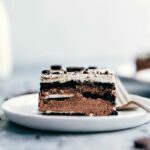 While I’m partial to this oreo icebox cake, below are some ideas if you’re looking to branch out to some different flavors next time! 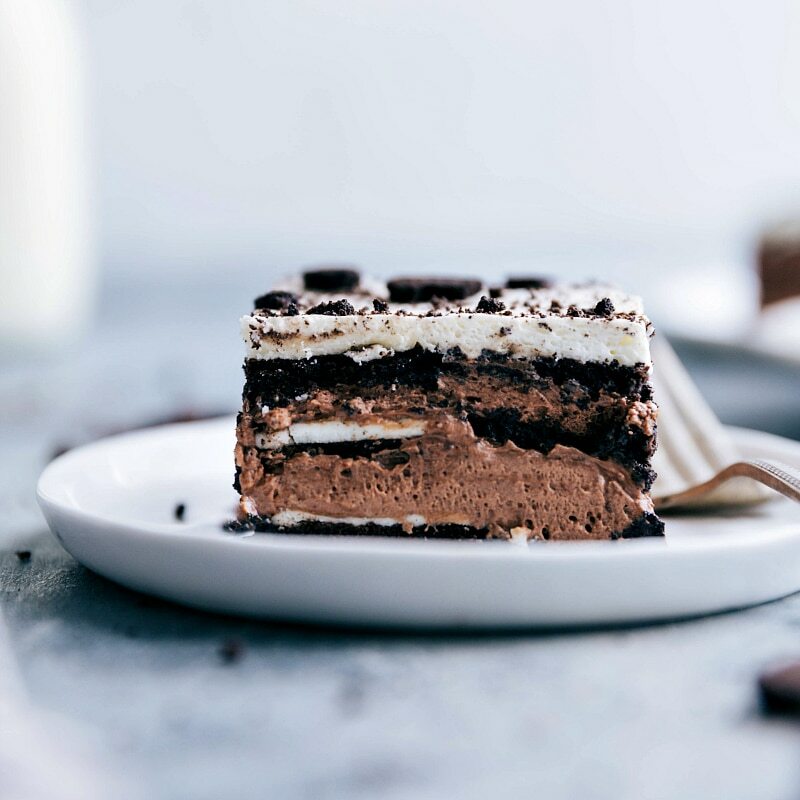 This no-baking-required icebox cake is made with layers of oreo cookies and nutella chocolate cream. It's topped with whipped cream and crushed oreos. In a large microwave safe bowl, microwave 1 and 1/2 cups high-quality chopped chocolate or chocolate chips in bursts of 15 seconds, stirring in-between each burst for 15 seconds. Be very careful to slowly heat the chocolate and stir it frequently so it doesn't seize when other ingredients are added. 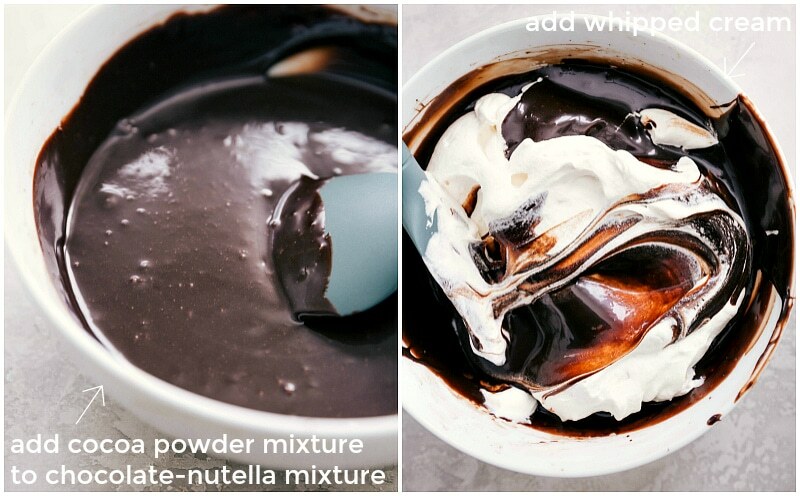 Stir in 1/2 cup Nutella until smooth and set aside. 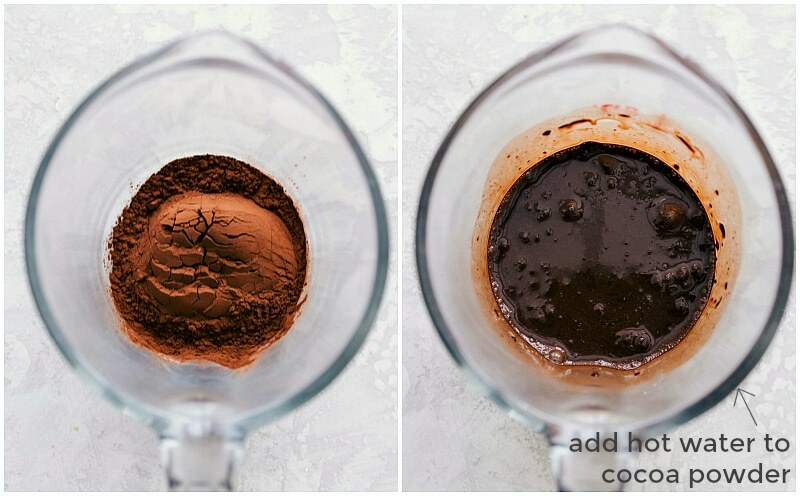 In another bowl, combine cocoa powder and very hot water. Whisk until completely combined. Allow to slightly cool (both the melted chocolate mixture and this cocoa powder mixture should be about the same temperature). 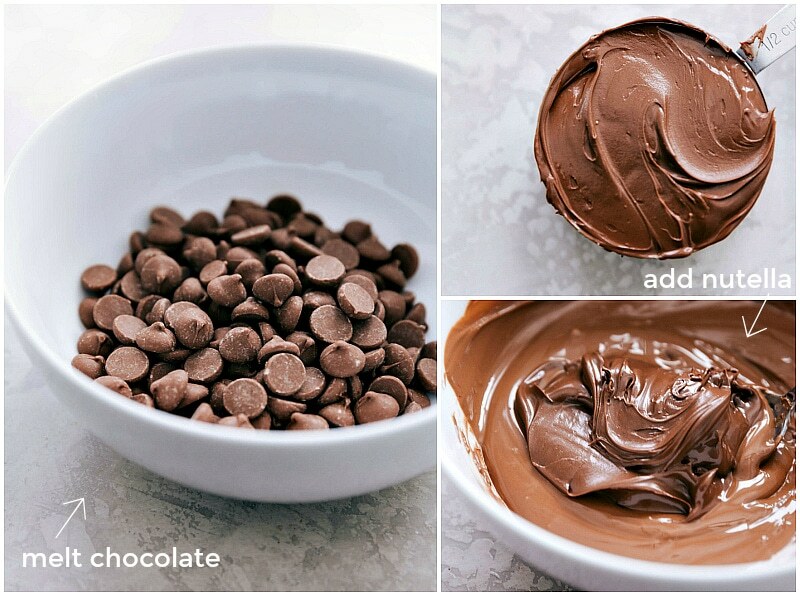 Gradually add the cocoa powder mixture to the chocolate mixture while beating with hand mixers until completely smooth. It might look like it's not going to come together, but keep mixing, it will come together! Take 2 cups of cold heavy whipping cream (you'll whip the last cup later) and whip in a stand mixer until it reaches soft peaks. While whipping, add in the vanilla extract and 1/4 cup powdered sugar. Add half of the whipped cream to the chocolate mixture and fold in gently. Take this mixture and add it all to the rest of the whipped cream. Gently fold until completely combined. The cream may seem a bit thin or even watery. Cover and place in the fridge to firm up for 1 hour. With a spatula, gently fold the cream again after chilling. Grab a 9 x 13 pan and the oreos. Fill a bowl with the whole milk. 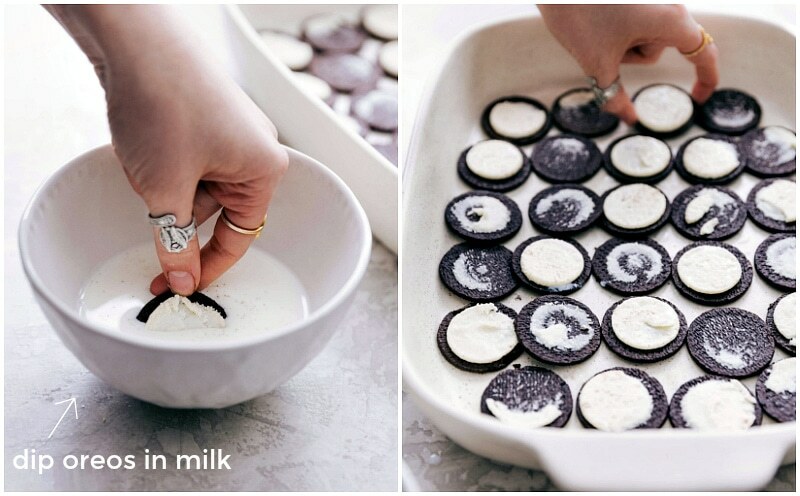 Separate the oreos (no need to remove or separate the creme filling) and dunk the halved oreo in the milk (no need to soak; just a dip). Place on the bottom of the pan. Repeat with each halved oreo placing the creme sides up. (It doesn't really matter where the oreo halves with creme end up since we're doing layers). Once the oreos are all in an even layer, spread half of the chocolate cream over the oreo layer. Repeat the oreo layer by again separating oreos, dunking in milk, and placing on top of the chocolate cream in an even layer. Repeat the chocolate cream layer using the rest of the chocolate cream. 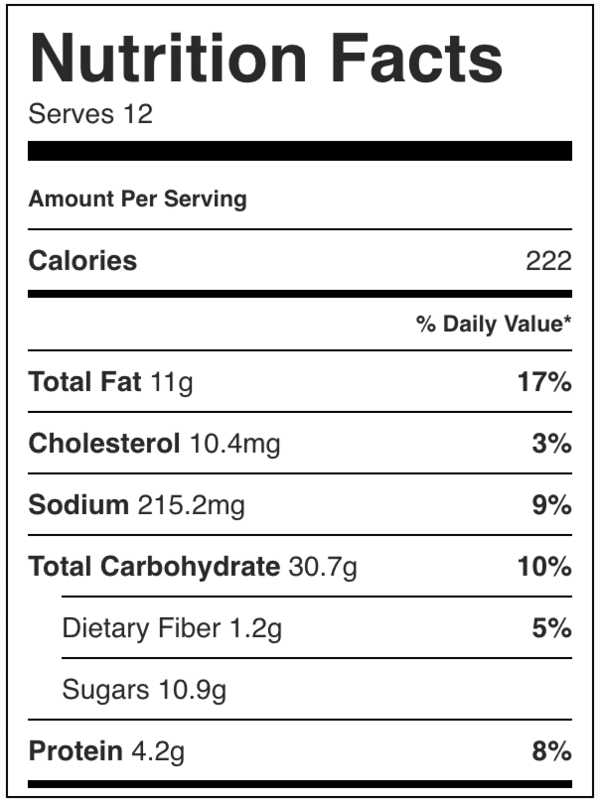 Add one last layer of dunked and halved oreos. In the stand mixture, whip the remaining 1 cup whipped cream with the remaining 2 tablespoons powdered sugar. Whip until you reach soft peaks. Spread evenly over the top of the oreos. Crush up (with your hands) 2-3 leftover oreos to decorate the top of the cake. Cover and place in the fridge for at least 8 hours and preferably overnight. When ready to serve, remove from fridge and cut into squares. Serve. Return any leftovers promptly to the fridge. Icebox cake lasts up to 1 week in the fridge. Unfortunately, this cake doesn't freeze and thaw well.